At Microsoft Build 2017, Joe Belfiore announced that the new OneDrive Files On-Demand feature will be delivered with the Windows 10 Fall Creators Update. With Files On-Demand, you can access all your files in the cloud without having to download them and use storage space on your device. 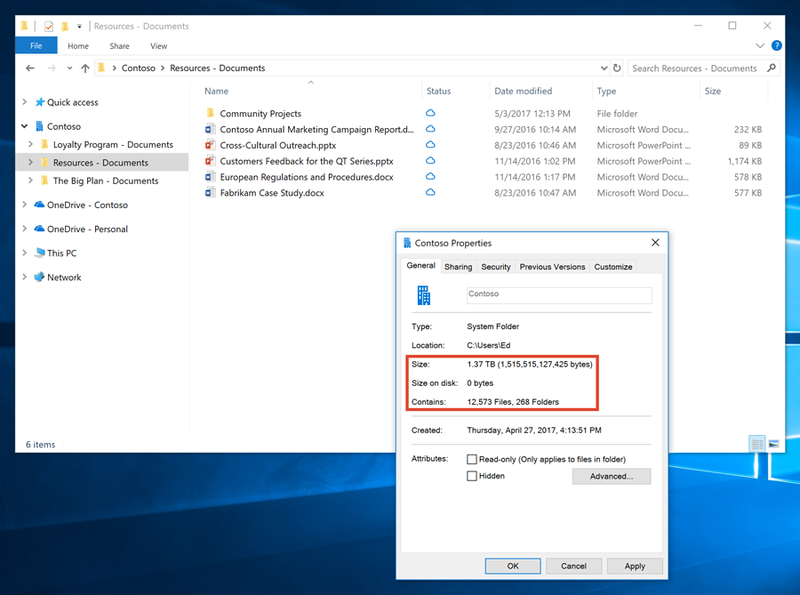 You don’t have to change the way you work, because all your files—even online files—can be seen in File Explorer and work just like every other file on your device. This has been the #1 requested feature for OneDrive on UserVoice, and we’re excited to deliver it in a simple and powerful new way. You can see that the folder selected in the SharePoint Online team site contains 1.37 TB of content but takes 0 bytes of storage on the disk. 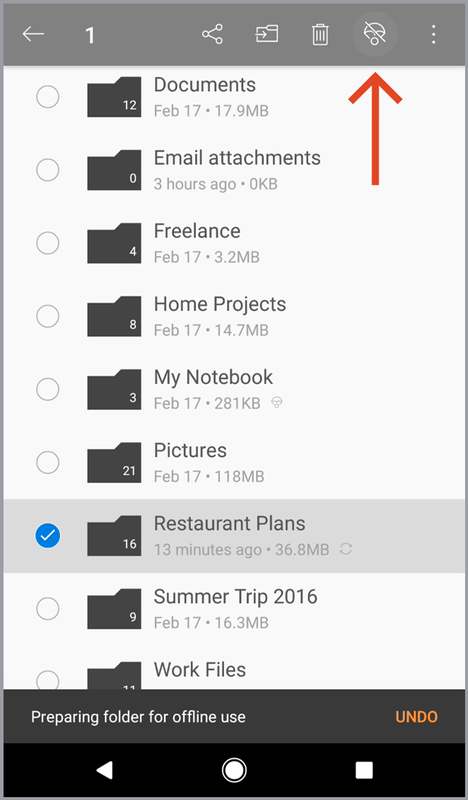 New status icons in File Explorer make it easy to know whether your files are locally available or online files. For files that you need to access when you don’t have an internet connection, you can easily make files or folders always available by right-clicking and selecting Always keep on this device. Right-click and select Always keep on this device to make files and folders accessible when you do not have an internet connection. Online files will automatically download and become locally available when you need them. Simply double-click a file in File Explorer or open it from within an app. Your online files will always be visible even if you are offline. Now you won’t have to make tough decisions about which files to sync to your PC. Double-click an online file and it will automatically download and open. In addition to users, Files On-Demand benefits organizations and IT admins. Today, when someone syncs a SharePoint Online team site, files are re-downloaded on all synced devices when anyone makes a change. Files On-Demand will reduce network bandwidth by eliminating the need to continuously sync shared files on every synced device as teams collaborate. Files On-Demand is coming to Windows Insider Preview early this summer and will be publicly available with the Windows 10 Fall Creators Update. Tune in to the SharePoint Virtual Summit on May 16, 2017 to learn more about Files On-Demand and how to create a connected workplace in Office 365 with OneDrive and SharePoint. In addition to Files On-Demand, we want to share a new feature with you to help you stay productive on your mobile device when you don’t have an internet connection, like on those long flights or weekends up at the cabin. OneDrive Offline Folders lets you save folders to your mobile device and open them when you don’t have an internet connection. Changes made by other users to the files while you’re offline will automatically be updated when you have an internet connection again. This new feature is now available on Android devices to Office 365 Personal and Home subscribers and OneDrive business accounts. We expect to roll it out to iOS in the next few months. Select a folder and click the Parachute icon to make a folder and its contents available offline. With OneDrive for iMessage, we made it even easier to share files on your iOS devices by allowing you to quickly share documents and photos with friends and family without leaving your iMessage conversation. Choose to share an entire folder or only a file and instantly preview documents and photos shared with you in iMessage. Update to the latest version of OneDrive and enable OneDrive for iMessage on your device to try today. Open OneDrive in iMessage and click a file to share it in your conversation. Let us know what you think. 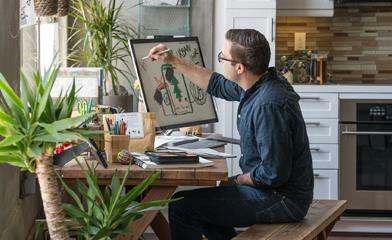 Please share your thoughts and ideas through the Microsoft Technical Community and UserVoice. There’s so much more to come with OneDrive!